Susan Zemsky came to Temple Shalom as Executive Director in 2003, bringing to our family the benefit of over 20 years’ experience in Jewish congregational and communal leadership. Prior to joining our senior staff team, she was the director of children and family services at the JCC in Rocville, Maryland after which time she served as the executive director at nearby Tifereth Israel Congregation. Before that, she managed special projects at the Board of Jewish Education of Greater Washington. She is currently on the board of trustees of Kehila Chadasha, a 100 family chavurah that is part of the Jewish Renewal movement. Susan is on the Board of Trustees of the National Association of Temple Administrators and serves as editor of their Journal. As director of Children and Family Services for the Jewish Community Center of Greater Washington, Susan created and implemented a full range of after-school, vacation and snow closing programs and Center-wide holiday festivals. 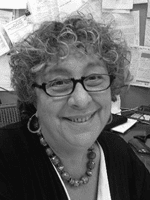 She was instrumental in building pro-family programs responsive to diverse family needs and configurations, such as the highly successful Jewish Single Parent Connection. "Creating and developing family friendly programs for children that put them in a safe and fun Jewish environment while their parents were working is something that I am especially proud of," says Susan. Rabbi Bruce E. Kahn D.D.